Comm Eye Health Vol. 20 No. 62 2007 pp 26 - 27. Published online 01 June 2007. Visually Impaired Centre for Teaching and Research (VICTAR), School of Education, University of Birmingham, Edgbaston, Birmingham B15 2TT, UK. 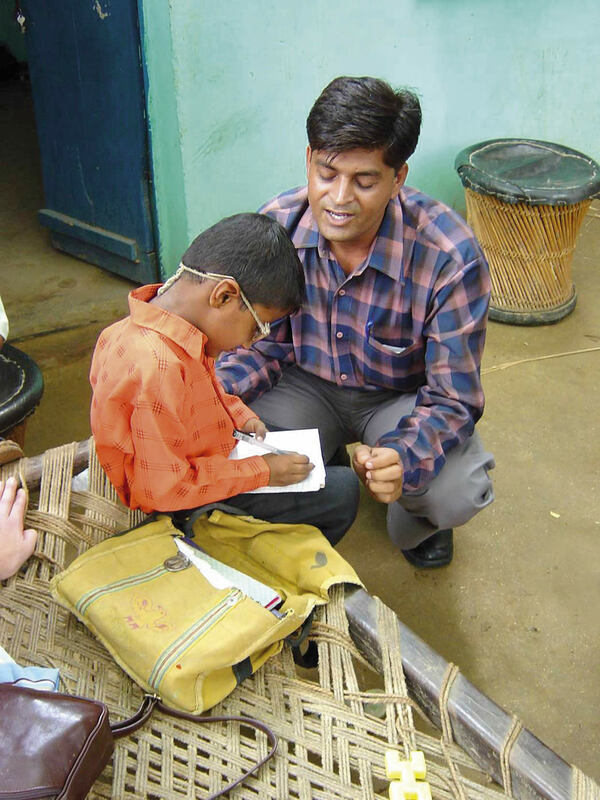 Providing education for visually impaired children is a challenge for many governments. Traditional solutions based around special schools can only cater for a small proportion of children who need support. Therefore, for practical reasons, local mainstream schools are often the only places where these children will have a chance of receiving education. However, visually impaired children attending a mainstream school will need additional support in order to cope with the demands it places on them. Because a great majority of early learning comes through vision, children who are blind or visually impaired will be slower to learn many skills than their sighted peers. Intervention at the preschool stage is thus very important as well – both to encourage these children to learn and develop, and to prepare them for mainstream schooling. One approach to providing support is to employ itinerant teachers, also known as ‘visiting’ or ‘peripatetic’ teachers. Itinerant teachers are usually qualified school teachers who have had some formal training in the education of children with visual impairment, either through a residential course or a distance education programme (e.g. a three-year diploma in Special Educational Needs). These teachers travel around local mainstream schools and communities to offer advice, resources, and support to visually impaired children, their teachers, and their parents. Itinerant teacher programmes have been established in several low- and middle-income countries (including Kenya, Uganda, and Malawi) in partnership with local ministries of education, and often with the support of non-governmental organisations. An itinerant teacher normally works under the direction of a full-time co-ordinator (usually someone with a background in teaching children with visual impairment) and may be given responsibility for a cluster of mainstream schools and homes in a given district (often 8–12 schools, depending on their geographical distribution). Itinerant teachers are usually released from their main teaching work for two days a week in order to carry out their itinerant duties. This release arrangement is agreed at ministry level; in practice, however, itinerant teachers can only travel to schools and homes if they have previously arranged for colleagues to teach their class in their absence. The duties performed by an itinerant teacher can vary between teachers and from one district to another. There are no official job descriptions to help define their role, but many of the following duties are common to itinerant teaching services in Uganda and Kenya. Itinerant teachers travel to mainstream schools to provide individual tutoring in reading and writing Braille (using a frame and stylus) for blind children and those with severe low vision. They transcribe class work, tests, and examinations to and from Braille for both teachers and children, provide advice to class teachers on how to meet children’s needs in the classroom (e.g. the best position for a child in the classroom), and instruct children in the use and care of low vision aids. Itinerant teachers play an important role in this development process by spending time with visually impaired children at home in order to prepare them for primary school education. They provide tutoring in pre-Braille skills (e.g. sorting and matching activities) and daily living skills. They also play an important role in developing young children’s orientation and mobility skills by assisting local rehabilitation workers with home-based programmes. Itinerant teachers are often the first professionals to identify that a child has a problem with vision. They will normally alert their co-ordinator, who will then refer the child for clinical assessment. In the case of older pre-school children, itinerant teachers may carry out a preliminary functional visual assessment (perhaps using an E-chart) and may set the child a range of practical tasks to assess their current level of visual functioning. These teachers are often an important link between families and clinicians. They can provide health professionals with useful background information about a child’s circumstances and visual functioning. They also follow up children who have been prescribed spectacles or low vision aids, provide parents with information on where to buy aids, and seek funding for parents who are unable to afford them. Itinerant teachers provide individual and family counselling on how to raise a child who is visually impaired. They can also help the family to see their child in a positive light and to develop a supportive attitude towards their child. This will help with schooling and independence. Itinerant teachers also provide practical support to families, such as organising hospital and eye clinic visits for parents. Itinerant teachers can sensitise local primary schools about issues related to teaching a visually impaired child in a mainstream class. In Uganda and Kenya, itinerant teachers play a key role in sensitising communities about the importance of sending children with disabilities to school. a lack of moral support from the teaching profession. One of the biggest challenges itinerant teachers face is working with visually impaired children who have additional complex needs or disabilities. Teachers who work with these children at home need to be able to deliver a programme of training in basic development areas (i.e. motor, communication, and social skills) and involve parents in practising these skills with the child. Unfortunately, many itinerant teachers are not sufficiently trained to work with these children. In spite of the many challenges they face in their work, itinerant teachers still offer a range of skills that can complement the skills of other professionals in eye care and rehabilitation. This will ensure that visually impaired infants and young children go on to take part in education and training, including mainstream schools. We would like to encourage health professionals in eye care and paediatric care to work closely with itinerant teachers in districts and sub-districts where these teaching services are available. Health workers should be able to draw on the skills of itinerant teachers and on their knowledge of the community, family, and children when deciding which intervention programmes to implement, or when prescribing low vision aids or other equipment. Provided they are given adequate support from their school and other professionals, itinerant teachers can play an essential part in ensuring visually impaired children receive the care and skills training they need. 1 Brouillette J, Thorburn M, Yamaguchi K. Early childhood special education: an international perspective. In: Mittler P, Brouillette R, Harris D, eds. World education yearbook of education: special needs education. London: Philadelphia, 1993.